Summer party themes can add a special touch to your gathering. Whether you are going for a laid back picnic or an elegant dinner, a theme can tie it all together. In addition, if you have a swimming pool, use that as well. No beach is complete without water. Set up a beach around the pool and let your guests enjoy their mini-vacation. Bring Hawaii to your home and have a luau party. This party theme is a popular choice for a summer get-together. Be sure to have your guests wear Hawaiian shirts or grass skirts. This can be noted on the invitation. When your guests arrive, hand each one a lei. Pineapple, tropical drinks and a pig roast are perfect items to serve at your luau. Use luminaries to light the paths to your party. Hula dancing and music will complete the theme. Decorate tables with red and white plaid tablecloths. You can also use blankets on the ground for a picnic-like atmosphere. For an evening party, consider a tiki theme. You can set up an outdoor bar and use grass skirting around it. Tiki torches can be displayed around the area as well as strings of lights. Serve summer-time drinks such as margaritas, daiquiris and piña coladas. The menu can include chicken, steak and pork kabobs, fresh fruits and vegetables and various finger foods. No tiki party is complete without reggae music and a game of limbo. A garden party can be simple and elegant. This theme can be easily done by setting up an area close to your flower garden or on a deck. Decorate with lots of fresh flowers and use decorative pots to complete the décor. Add a tablecloth and napkins done in a floral motif and your are set to enjoy your party. Serve food that is in season and fresh from the garden. Iced tea and lemonade go well with this party theme. Celebrate the Fourth of July with a patriotic party theme. Decorate in red, white and blue. Hang balloons and streamers and have sparklers as accents. Anything done in red, white and blue will fit well with this theme. All-American favorites such as hot dogs and apple pie can be served. When the weather is warm, have a movie night in your backyard. Invite your neighbors and enjoy being under the stars. You can hang a white sheet on your house or from a raised deck to serve as a screen. A projector is a must as well. There are even inflatable screens that can be used. Lawn chairs, blankets and sleeping bags will provide comfortable seating. Serve movie-time treats such as popcorn, candy and soda. 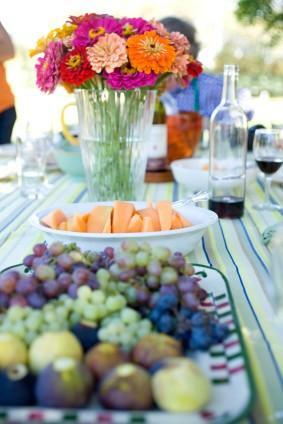 Summer parties are a great way to enjoy the outdoors while mingling with friends and family. There are numerous themes to consider for your party that will entertain your guests and bring lots of fun to your day. Be creative and come up with your own ideas to impress your guests. The theme can be used on the invitation, for decorations and when deciding on the menu.